As a power user, I didn’t find PCoIP convenient sometimes, especially when copying files between my physical desktop and my virtual desktop. I ended up using a FTP server instead of drag and drop. It worked but not as quite convenient as I expected it to be. Weeks ago, my colleague told me that I should try RDP. He then did a little tweak on my View Client. 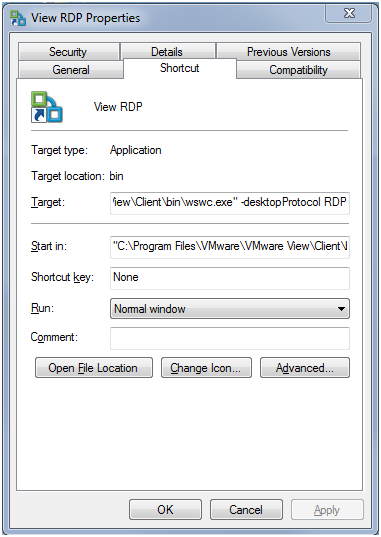 Basically when the View Client was about to start, he quickly clicked a small button and changed the option to RDP. Not that straightforward. But after that, I can drag and drop file from my physical desktop to the VDI. After these changes, I can pick either protocol with one click. Better than I expected, I can easily switch between these two protocols on the fly. For example, while using PCoIP, I double click the “View RDP” and get the following dialog box after picking the VDI desktop. After my acknowledgement, View Client re-connects to VDI with new protocol without asking login again, which is very convenient. Virtualization Matters Except When It Doesn’t vSphere APIs for Guest Operating System Management: What’s Special and When to Use It?